Well she still has a lot of energy left! 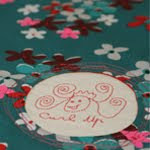 Curl Up is established by a mother of five, who lives in the Middle East. She attempts to combine her passions for rugby and sewing, with cooking, motherhood, Mr Curl Up and his artificial grass. Mrs Curl Up is a perfectionist to the letter who has to be reminded on a regularly basis that the view halfway to the top of the mountain might already be stunning.